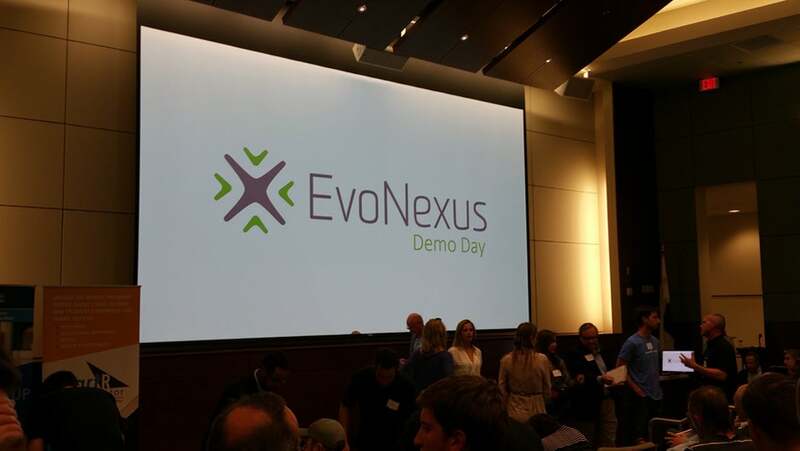 Last night EvoNexus held their third ever Demo Day to celebrate the ideas, companies, and entrepreneurs who have gone through a rigorous program during their initial four months at the incubator. While it’s the third Demo Day they’ve held, this marks the first time EvoNexus has had the event at UCSD’s Rady School of Management: a truly grand forum for celebration. During their time in EvoNexus the focus for the companies presenting has been to create a minimum sellable product, validate their market, and provide their business model to customers. In total there were 16 companies who took the stage to present, most of which were either part of the EvoStart or EvoLaunch programs. All said, the event was oversold by about 200 people, and the auditorium was packed to the gills with people. There were also 60 investors in the crowd looking for new companies to invest in as well as a corporate presence from some of San Diego’s big name companies like Qualcomm. This is a shining example of the impact EvoNexus has on the San Diego tech ecosystem: they successfully united the corporate, startup, and local communities together to celebrate innovation and entrepreneurship. And yours truly had a front row, VIP seat to catch all the action. Sonic VR: Through a combination of hardware and the latest audio technologies, they utilize 3D audio, or “object-based” audio, to position sounds all around you in a 360 degree grid, just as they would be in real life. This is the world beyond surround sound – this is fully immersive sound that pairs with a virtual reality experience. Your ears will hear sound exactly what you would hear if you were standing right there in the environment. CleverPet: Think Simon for dogs: CleverPet was founded by cognitive scientists and neuroscientists who have a love of animals. Their technology helps pets lead happier and healthier lives by automatically teaching and engaging them when you’re gone. They also keep you connected with your pet and track data during the day so that being apart is less stressful for both of you. Doctible: Built on the philosophy that paying cash for healthcare visits is most always going to be cheaper than alternative payment methods, Doctible empowers consumers to shop for healthcare based on price, quality, and convenience. Tortuga Logic: Software security continues to make countless advances toward more effective languages, software engineering practices, and program analysis. However, the hardware underlying all of these advances has continued a march in the opposite direction toward increased complexity, reduced software control of hidden state, and higher level of dynamism in search of the highest performance possible. Tortuga Logic wants to ensure the security of these hardware designs and prevent cyber security breaches. PartySpark: PartySpark is an event booking site similar to what Priceline is to the travel industry, but for events. The platform lets you compare local event vendors such as catering, photography, DJs, florists, entertainment acts, and rentals. You can also browse local vendors by price, package, availability, and reviews and then book them directly through the website, which saves the end consumer time and money. Obrary: Obrary is a marketplace of products collaboratively designed by the community. These products can be designed or produced by anyone, amateur or professional manufacturer, wherever economically or reasonably practical. Specifically they make it easy to be a ‘maker’ via software automation of manufacturing processes. Skylit Medical: Skylit Medical is a connected device that uses cutting edge LED technology to bring personal, private prescription phototherapy to patients with psoriasis, eczema and vitiligo. According to third party research, 95 percetn of physicians would prescribe Skylit Medical because they could maintain a relationship with their patients while patients can forego the time consuming clinic visits for this treatment. UVA Mobile: A progressive new generation wireless provider who believes in wireless for all. The company was established by passionate wireless experts with one simple goal in mind, to make people happy again by removing all the frustrations associated with yesterday’s wireless service plans. You build your plan how you want with no contracts. What Say You: This social platform seeks to ask the world questions to reveal the connections we all share. Every 24 hours they ask the globe a question and then interpret the data into easily consumable visual assets. The team wants to honor the childlike curiosity inherent in humanity by sharing our thoughts, feelings, and beliefs about the world. Lab Fellows: The team is building Lab Fellows to be the definitive online marketplace for Labs On Demand, matching scientists with facilities and equipment to perform their experiments for one tenth of the cost of owning. INOVA DRONE: An advanced and easy to use Commercial Unmanned Aerial System that was designed to save lives and protect mankind. The INOVA team has spent years in the UAS industry and plans to disrupt the market by enhancing the UX of advanced aircraft tech combined with intuitive and powerful software. Lennd: A free vendor-to-vendor photo sharing platform, Lennd operates via communications and collaboration so teams don’t lose their event photos and get credit for their hard work. AUDVI: Their mission is simple: allow anyone with a visual, literacy, or other barrier access to written information. Audvi is an organization driven by a belief that technology can meaningfully contribute to the improvement of many lives by increasing audible accessibility. The team is working tirelessly to break down one of the greatest barriers that people with dyslexia struggle against daily: the ability to access written information. GroupSolver: A marketing research tool that helps firms quickly and cost effectively synthesize customer feedback into succinct managerial insights. Simply ask a question, describe your audience, and GroupSolver will tell you their unique story. MANTA Instruments: MANTA Instruments is commercializing scientific instruments that use breakthrough technology to characterize nanoparticles much more effectively than existing products. The current instruments for characterizing nanoparticles are unable to adequately measure concentration of nanoparticles, measure samples with mixed nanoparticle sizes, and reliably measure changes in nanoparticle size over time. Ksafe: kSafe is a smart, connected, lockable safe that only opens when your goals have been achieved. The team wants to help any and everybody improve their health and wellness through their solution, which has surpassed its $50,000 Kickstarter goal in under two days.